Neither rain, nor sleet, nor snow could slow down the Eastern Mennonite basketball women Saturday, as they scored the first 10 points and never trailed in a 76-62 win at Mt. Aloysius in Cresson, Pa. In an effort to beat an impending snowstorm in the region, the Royals drove up Friday night and moved the start time to 11 a.m. The Royals looked good in the non-conference win. Jess Rheinheimer (Manheim, Pa./Lancaster Mennonite) nailed a pair of three pointers as EMU jumped ahead 10-0 just 2:09 into the contest. The host Mounties eventually tied the score at 13-13, but the Royals exploded on a 25-9 run over the final 6:04 of the half to lead 43-26 at the break. Mt. Aloysius got within 11 points at 45-34, but the women kept control in a second half void of any large runs. The Royals led by as many as 21 before the Mountie bench ended the game on a 9-2 run for the final margin. Eastern Mennonite had a 43-to-35 percent shooting edge, including making 7-of-17 three pointers. Even though MAC only committed 17 fouls, the Royals turned that into 27 free throw attempts, making 17. The women also had a 47-41 advantage on the boards. Bianca Ygarza (Conestoga, Pa./Penn Manor) led a balanced attack with 17 points, eight rebounds and six assists. This is the third time in the past four games that Ygarza has tied her career high with six helpers. Rheinheimer finished with 12 points and a game high nine rebounds. Alisa Brown (Dumfries, Va./Forest Park) added 12 and three steals. Point guard Keyla Baltimore (Bristow, Va./Brentsville District) had 10 points and six assists. Off the bench, Shakeerah Sykes (Dumfries, Va./Forest Park) was good for nine rebounds and eight points. 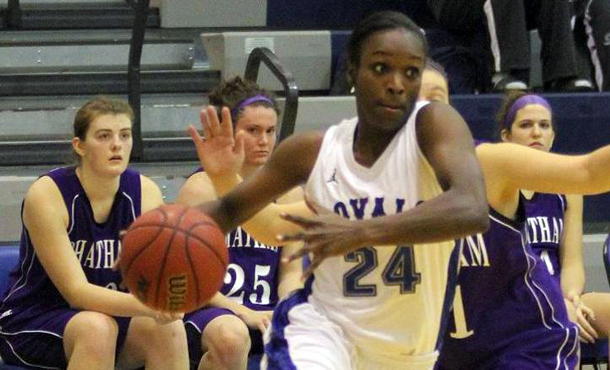 Nora Osei (Springfield, Va./West Springfield) scored nine points. Mt. Aloysius’ leading scorer, Becky Bard, scored a game high 20 points, but needed 23 shots to do it. Eastern Mennonite improves to 7-2 with the win. The women have one more game before the Christmas break, playing at Washington College on Tuesday. Game time in Chestertown, Md., is 6 p.m.